Moycraig YFC’s annual barbecue was held on Saturday, June 30th at Armoy Rugby Club with the theme ‘Wild Wild West’. The barbecue is one of the club’s largest, most looked forward to events in the yearly calendar. Members of many clubs as well as many non-members came together for a night of socialising, dancing and having a bit of craic. This year David Black provided the fantastic music. The club would like to thank him for this. 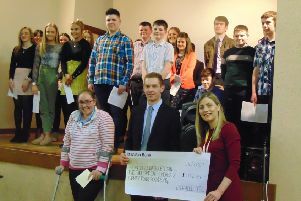 Rachel Smith of Moycraig YFC said: “On behalf of Moycraig YFC I would like to extend a sincere thank you to those neighbouring clubs and those who travelled from various parts of the country to make the event a success. Your support is very much appreciated. “This year again our barbecue was a huge success, however this would not have been achievable without the hard work of our members and committee who helped in many ways during the lead up to and indeed at the event. However, it doesn’t stop there! Moycraig YFC are now looking forward to the busy few summer months ahead with the annual sports night taking place on Friday, July 20th. To keep up to date with the club follow their Facebook page.